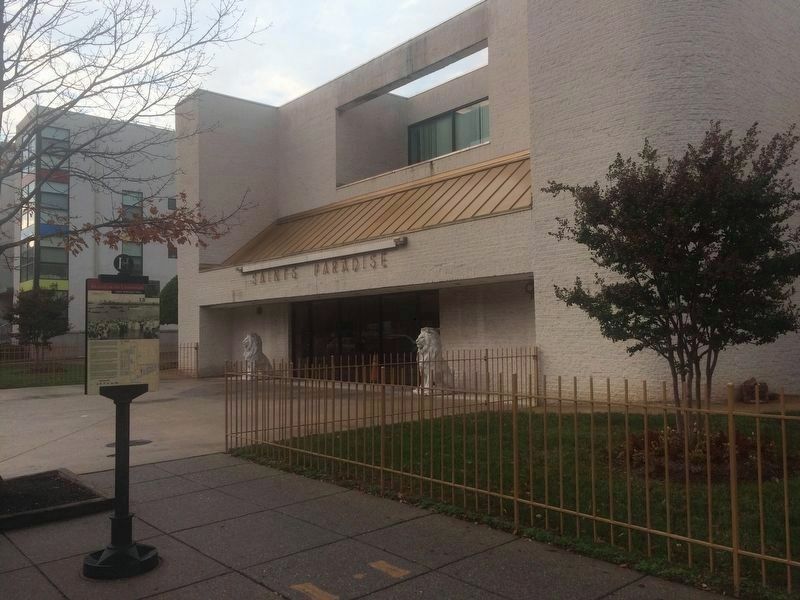 Along this block is the world headquarters of the United House of Prayer for All People. Founded in 1919 in Massachusetts by Charles M. “Sweet Daddy” Grace, the church moved its headquarters to Washington in 1926. Soon after, it purchased a mansion where the church is today. The mansion had housed Frelinghuysen University, a night school headed by noted educator Anna J. Cooper. Bishop Grace’s mass baptisms were legendary. One year he baptized 208 people in front of 15,000 onlookers here on M Street, with water provided by local fire fighters. At the time of the flamboyant, charismatic evangelist’s death in 1960, his church claimed three million members in 14 states. Bishop Grace was succeeded by Bishop Walter McCollough, who expanded the church’s political influence. Under McCollough, the church purchased and built hundreds of units of affordable housing in Shaw and Southeast, as well as in North Carolina and Connecticut. The church is also known for its Saints Paradise Cafeteria, community service, music and outreach to the poor. often traded spaces as their numbers grew or shrank, or they followed their membership to the suburbs. 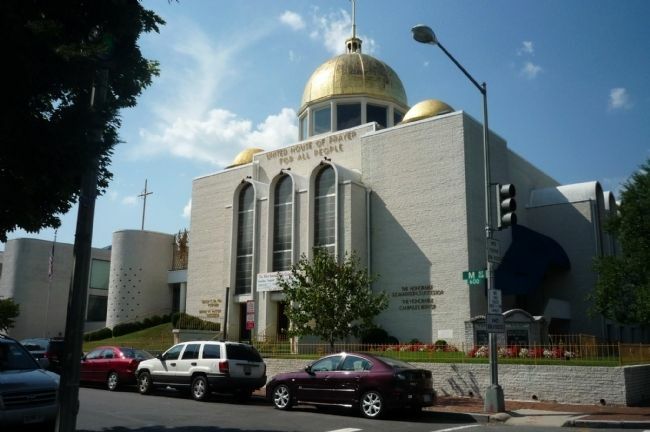 Along the trail you will see current and former houses of worship for Islam, A.M.E. Zion, Baptist, Catholic, Christian, Christian Evangelical, Greek Orthodox, Jewish, and other faiths. 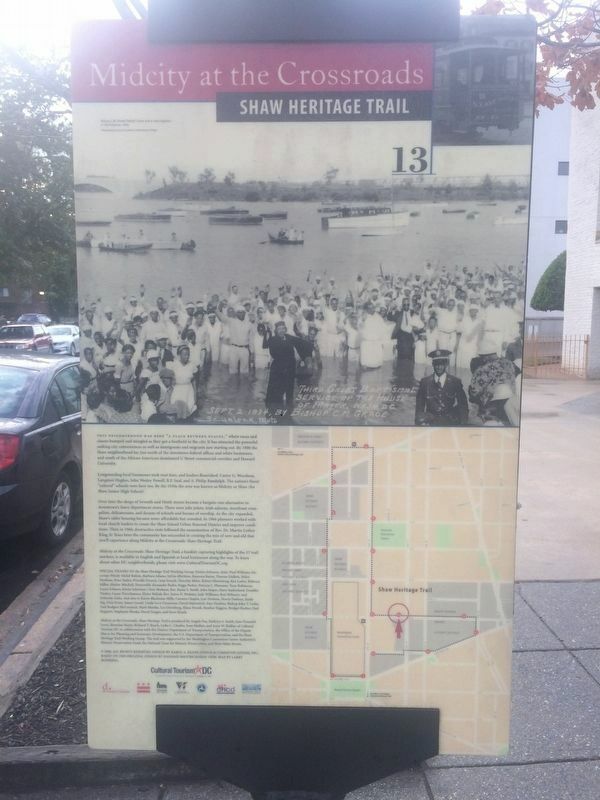 the Shaw neighborhood lay just north of the downtown federal offices and white businesses, and south of the African-American-dominated U Street commercial corridor and Howard University. Over time the shops of Seventh and Ninth streets became a bargain-rate alternative to downtown’s fancy department stores. There were juke joints, Irish saloons, storefront evangelists, delicatessens, and dozens of schools and houses of worship. As the city expanded, Shaw’s older housing became more affordable but crowded. In 1966 planners worked with local church leaders to create the Shaw School Urban Renewal District and improve conditions. Then in 1968, destructive riots followed the assassination of Rev. Dr. Martin Luther King, Jr. Years later the community has succeeded in creating the mix of new and old that you’ll experience along Midcity at the Crossroads: Shaw Heritage Trail. 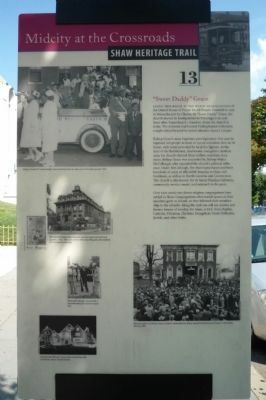 about other DC neighborhoods, please visit www.CulturalTourismDC.org. 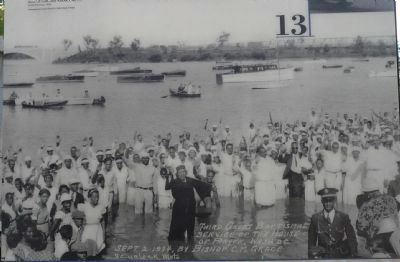 Bishop C. M. “Sweet Daddy” Grace and a mass baptism in the Potomac, 1934. Location. 38° 54.343′ N, 77° 1.216′ W. Marker is in Mount Vernon Square, District of Columbia, in Washington. Marker is on M Street Northwest west of 6th Street Northwest, on the right when traveling west. Touch for map. 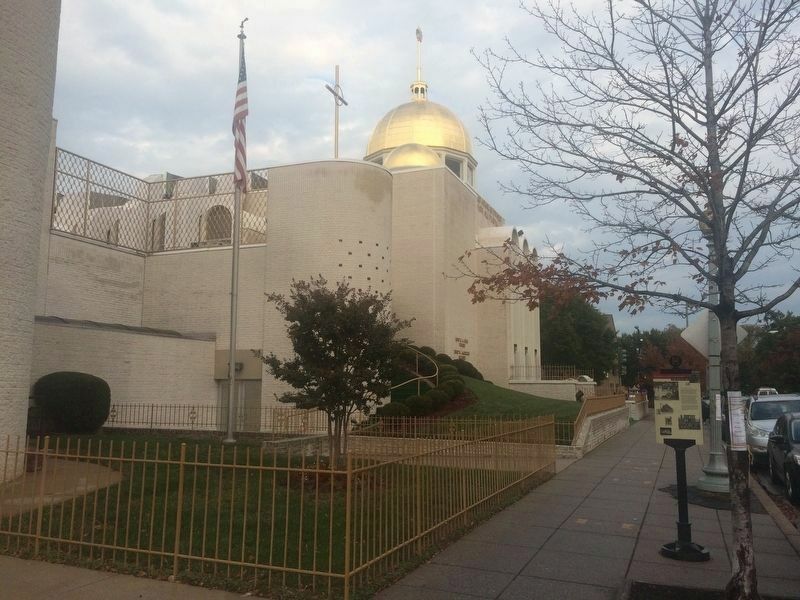 Marker is at or near this postal address: 601 M Street Northwest, Washington DC 20001, United States of America. Touch for directions. Other nearby markers. At least 8 other markers are within walking distance of this marker. Reaching for Equality (about 400 feet away, measured in a direct line); Seventh Street Develops (about 700 feet away); To Market, To Market (about 700 feet away); The Place to Shop (about 700 feet away); Remembering "the Village" (about 700 feet away); Roots of Saint Sophia Greek Orthodox Cathedral (about 700 feet away); Immaculate Conception Catholic School (approx. 0.2 miles away); History in a House (approx. 0.2 miles away). Touch for a list and map of all markers in Mount Vernon Square. Additional keywords. 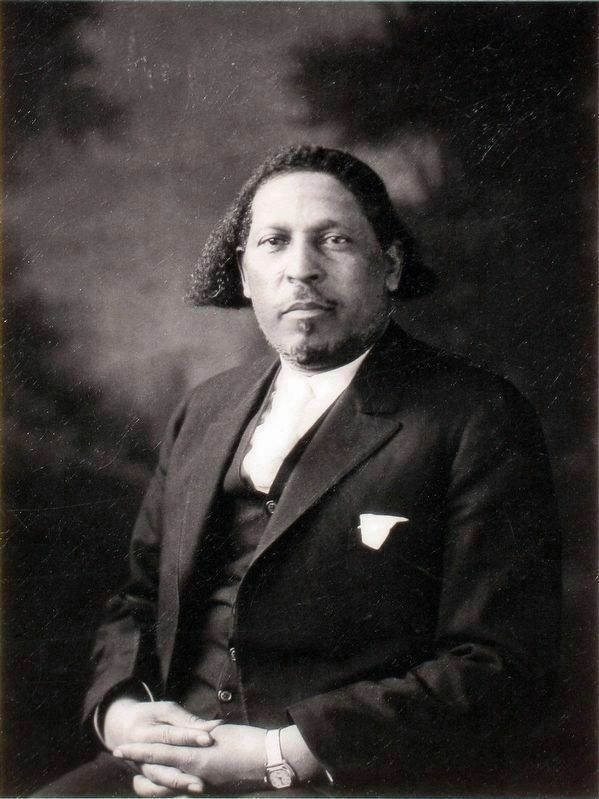 Marcelino Manuel da Graça; Cape Verdean Americans. The Saints Paradise Cafeteria can be seen in the background in this view to the west. Stained glass window at Fort Lincoln Cemetery Mausoleum. More. Search the internet for “Sweet Daddy” Grace. Credits. This page was last revised on March 23, 2019. This page originally submitted on February 19, 2010, by Richard E. Miller of Oxon Hill, Maryland. This page has been viewed 5,203 times since then and 30 times this year. Last updated on March 8, 2019, by Devry Becker Jones of Washington, District of Columbia. Photos: 1, 2, 3. submitted on February 19, 2010, by Richard E. Miller of Oxon Hill, Maryland. 4, 5, 6. submitted on October 27, 2016, by J. Makali Bruton of Querétaro, Mexico. 7, 8. submitted on October 27, 2016, by Allen C. Browne of Silver Spring, Maryland. • Bill Pfingsten was the editor who published this page.